Manufactured by Winchester, these 22 WMR rounds are the perfect choice for hunting all kinds of small game, from prairie dogs and squirrels to fox and coyote. 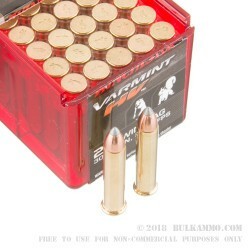 These rounds are loaded with Hornady’s V-Max bullets, which are poly-tipped 30 grain projectiles designed to fly on a flat trajectory toward your target. 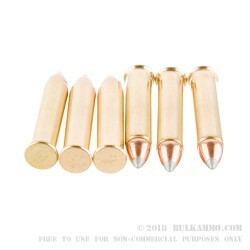 At the point of impact, these bullets will expand and fragment, allowing to quickly and humanely take your favorite small game. The muzzle velocity for these rounds is 2250 feet per second. The pairing of Winchester manufacturing with a Hornady bullet brings together two titans of American ammunition manufacturing. They each have an impeccable reputation for making quality rounds that meet hunters’ needs. Needless to say, this is a match made in heaven. You won’t be disappointed with these rounds. Not bad rounds and not a bad price.